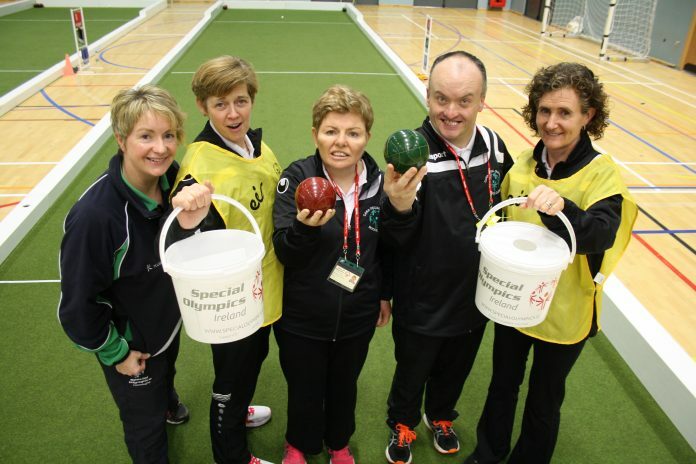 GIVE GENEROUSLY: Participants and coaches from the Cara Special Olympics Bocce Club Sligo pictured at the launch of Special Olympics Ireland’s annual Collection Day on May 5. Pictured (l-r) are Myra Merrick (Regional Director, Special Olympics), Ailish Murphy (Coach), Geraldine Marren (Athlete), Francis Kenny (Athlete) and Trisha Burke (Coach). Special Olympics Ireland are issuing a call for their annual Collection Day in Sligo tomorrow, Friday May 5 to help transform lives through sport. Special Olympics has a long history in Yeats country. Regional Advancement events are taking place throughout Connaught and the county is well represented across 13 sports including bocce. Francis Kenny and Geraldine Marren from Tubbercurry competed at the Special Olympics Connaught Region Bocce Advancement Event at NUI Galway. They train with Cara Bocce Special Olympics Club. Connaught Regional Director Myra Merrick explained the importance of sport in the lives of people with intellectual disabilities like Francis and Geraldine. Athletes from as young as six can train in a chosen sport and ultimately improve their quality of life. Athletes’ families build an invaluable network of friendship and support, but money raised through the annual Collection Day is critical to the future of the programme. This year’s goal is to raise €650,000 on May 5. “We need 150 people to help in Sligo alone,” said Merrick. People looking to volunteer can register their interest at www.specialolympics.ie/collectionday. Anyone who is unable to volunteer is asked to give what they can on the day or make a donation online.